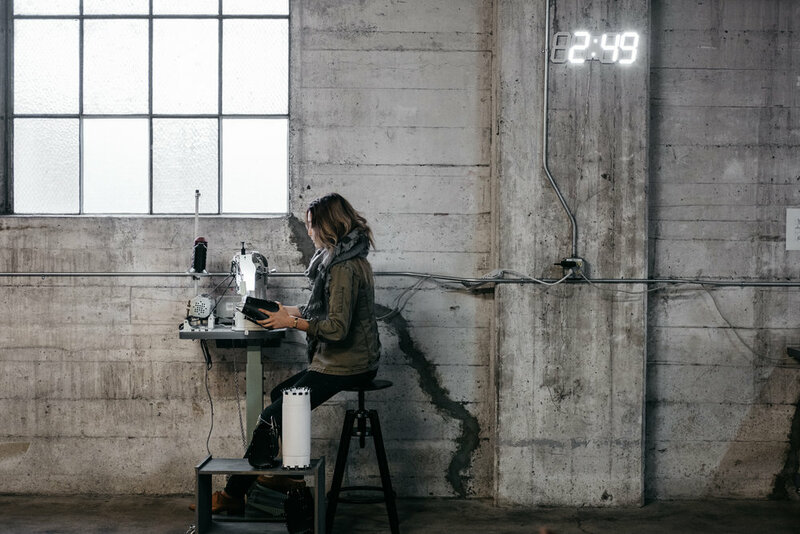 Theresa Lee is the owner and co-founder of Future Glory Co., a boutique specializing in handmade leather bags and purses, all designed and made right here in San Francisco, CA. I first met her at a bar through a mutual friend the last time the Giants were in the World Series (2014, in case anyone forgot), and we've been friends ever since. During one of our rainy days earlier this month, I got to chat with and shoot Theresa at Future Glory Co.'s brand new workspace. Describe a bit about yourself and what got you to this point. I had been a designer for about a decade in the city, and I always found myself not fully satisfied and not fully utilized. I always knew I would start my own business, but it took me that long to build up my skillset and my confidence, white at the same time running out of creative juices, and I was at a dead end with what I was doing. That’s why I ended up taking the plunge and starting my own business. I always knew how to sew though. My parents had a dry cleaners, and my mom did the alterations, and sometimes I would have to help with that. The DNA of small businesses and of sewing and making is who I am. We started with just one sewing machine in a Dogpatch loft apartment, and then over the course of a year or so, we were so cramped in that space that it was definitely time to come up with the money to get an actual workspace, and we’ve been in this space for about a month and a half. What were some challenges you faced when you first got started, and also presently? When I first got started, the biggest challenge was if we were even going to make it. It took quite a long time to get our company off the ground. Today, we’re at a level of relative success, so the question becomes is it sustainable, and is it going to continue? That’s definitely the challenge of a small business: it’s never a steady thing, it’s always going to fluctuate, and you never know what’s coming. What’s it been like establish a small business here? I love San Francisco because there’s so much creative energy, and most people you run into are talented. Half of the challenge starting here was mental, and the other half was getting it done. I had to get over my fears and doubts, especially considering what all of these other talented people are doing, and trying not to compare. Another thing about San Francisco that makes things harder is that the rent is crazy of course. But it also is a place that breeds so many fresh ideas that sometimes it’s easier to start things like this here. How big is the company, and what role do you play in it? We have seven people working for us, both part-time and full-time. As a business owner, I feel like I wear a lot of hats, from business stuff to managerial to ordering to production. Right now I’m trying to back out of the production world, because I need the business to sustain itself without me, otherwise I’ll never be able to take a vacation. I’m not the type to sit behind a computer 9 hours a day; I just liking making and getting things done, like hiring, product development, photography, the website, customer service... you name it, I’m probably doing it. What would you say sets your products apart from everything else in the industry? The thing that sets us apart is that we design and hand make everything in one place. The majority of products in the industry are made overseas and in mass quantities, typically with machines. Our process is different: we produce in small batches and made-to-order. Design wise, it took a while for us to distinguish ourselves, and that was part of the exploratory phase. But right now, our bags with the ring handles have really taken off. I think that’s because when we originally launched that design, there was nothing else like it out there. It’s very minimalistic and simplistic in its approach. That’s totally who I am as a person, keeping only the necessary elements and stripping everything else away. Speaking of the ring handled bags, I heard that there were some copyright infringement incidents by big brands of your products. How have you been dealing with that? Do you see it happening more in the future, and do you think it will be a problem? I do, yeah, It doesn’t make me very happy that these giant, multi-billion dollar companies don’t feel like they can pay creative people to come up with original designs, and they steal designs from independent makers like ourselves. It’s hard for people like us to fight back against that. So to me, it’s very disappointing. I know some people like to say that it’s an honor, but I have a hard time seeing it that way when I observe my designs being ripped off. What would you say that you are passionate about? I am very passionate about being able to create what I want to create without any hindrances, which was a big problem when I worked for other people. I was just told that I couldn’t do things, and my ideas were altered and bastardized so many times that by the time it got to the end result, I wasn’t into it whatsoever, and I wasn’t proud of it. So to me, that’s really important. That’s why I started my own business, so nobody could tell me what I had to change, what I had to do, and when I had to do it. I didn’t want any shortcuts taken, I didn’t want any compromises. I'm thankful that it’s worked out. We’ve had a good year, and we get to design what we have in our minds without anyone telling us that we can’t do it. A lot of people inspire me, but Elon Musk just popped into my head. I think he’s a pretty cool innovator and rebel, creating and doing things that only dreams are made of. People like him are great for moving society forward, rather than keeping it in a broken system. In terms of fashion, I really like Olivier Rousteing, the creative director of Balmain. He’s just a young kid from France, and he gave the brand a whole new life. It’s refreshing to see someone change a whole brand like that, and they just let him run with it and it’s been a tremendous success. Do you think it’s possible that people are able to be creative and do something they love while at the same time make a good living off of it? I think it’s a fine balance. You can’t be extravagant, and you have to be practical for sure. Even with our ideas, there’s a limit to how crazy we can get. You have to think about how it’s going to be made and if it’s going to be production-friendly. So I think you have to strategize with how creativity is outputted. What would you tell people who might be thinking about doing something similar to what you’re doing or branching off on their own? I would say that it’s a lot of work, but if they work incredibly hard at it, and it’s their number one priority, it will most likely succeed. There are so many more talented designers and smarter people than me, but I know that I can outwork a lot of people, and it’s just through my hard work that a lot of things have come into fruition, along with a level of skill that is necessary to get things done. But hard work is a key component. Where do you see the industry going in the future, and how do you intend to keep up with that? Clearly the industry right now is heading the way of fast fashion: everything is mass produced and seasonal. Our products are not meant to be seasonal; they’re meant to stand the test of time and be classic, and we’ll probably stick to that. We’ve always gone against the grain, and that’s part of who I am too. I can’t do anything “normal” most of the time. So who would you say that your bags are for? As far as the way I design bags, I can’t say that they’re super functional; they’re more like statement pieces. They are for more of a unique individual who wants to be a little different. Anyone who buys from us (we’re a relatively unknown company) is not someone who wants to be clothed in the same things that everyone else is wearing. Are the pieces mostly oriented towards women? Yes, 100%. A lot of the creative directors of women’s fashion houses are actually run by men. There’s only a very small percentage that’s run by women. It’s not because women are any less talented; it’s because they aren’t given the opportunity. I have a big chip on my shoulder because of that, so I feel like I only want to design for women at this time, because I know how women think. I know what we like, I know our psyche. If I were to try to branch out to men’s products, I wouldn’t have the insight. Anything I don’t think I can be excellent at, I don’t want to touch right now. Women’s rights issues are near and dear to my heart. When we started the company, we tried to have a focus on giving back to women’s organizations locally. Right now our team is comprised of all women. We want to provide jobs and training for women to get back on their feet. That’s part of the story behind the name. It wasn’t just about me wanting to accomplish my dreams, but also: if I was going to work so much, I wanted to do something with my life, and I want it to be meaningful. Growing up, I saw my mom struggle a lot, and I wanted to be able to provide help for other women if they needed it. That’s who I am at the core and what I’d like to be doing. What’s the foundation of the company, and do you have a mantra? The term “Future Glory” is from Scripture, Romans 8:18-24. It basically says that our present struggles pale in comparison to the glory that awaits us. That’s who I am: I’m never fully in the present; instead, I’m always daydreaming, wishing about this and that. Honestly, it’s not really a great place to be all the time. You have to find contentment and satisfaction in the present. 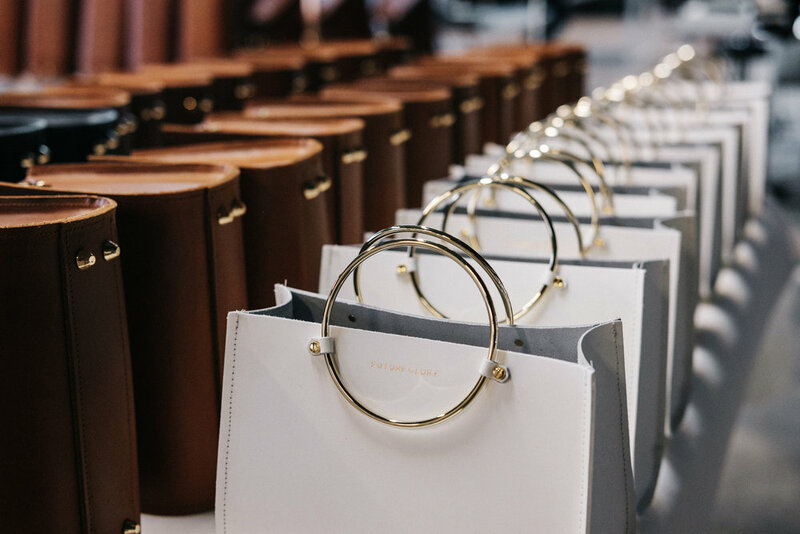 But anyway, that’s what the company was built upon: knowing that there’s more, and that there are better things for yourself and for society... one day we want to be the best bag makers in America. It’s never going to be good enough; we always want to keep growing. And at the same time, I always want to be a small company. I don’t want to spread myself out too thin to the point that things get compromised. Do you think it’s possible to find success and yet still remain a small company? Yes that is possible, but this is just my preference. I don’t want to sell out; I always want to be a boutique. I don’t want to crank out millions of bags. I want to produce a small amount that is high quality. So what’s your definition of “boutique”? To me, a boutique is independent. This may not be true for everyone, but for me, I don’t want to have to answer to anybody, I don’t necessarily want to be bought out by a huge conglomerate, never want to report to investors. I just want to be my own little world, create the best bags that we can possibly create, and offer products that people are interested in. It’s not money that we’re after, although a business has to be successful to, well, stay a business. We’re bracing ourselves for the holiday season; we always receive a lot of wholesale orders to complete, so that’s the most pressing thing on my mind at the moment. We also have a ton of international business. I never really thought I’d have to do it this way, but I’d like to grow our domestic market more. I just want to make sure that our growth and our presence here is not just a shooting star, but will stand the test of time, so I have to strategize on how that can happen. What is your definition of a good life? A good life is being able to be content and happy in any situation. It kind of goes against the grain of what Future Glory stands for, but no matter what the situation, this is the time to be alive and to experience life. If you can be satisfied in any situation, I think you have a good life. You can find Future Glory Co. online on Instagram, Facebook, and their website.